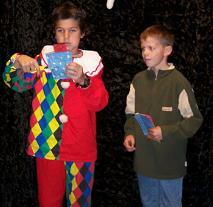 In 2004 I (Ivo) got the question from teacher Jef Boden, whether I could teach the children at the primary school in Brecht to do magic, because that was the school’s theme that year. Because I had once been a pupil at this school, I couldn’t refuse. Now I had the opportunity to stand before the classes where I had once sat myself. I suggested to use Project Magic. After a meeting with the principal, Annemie Suy, I got the green light. Every class was taught a different trick. They did have to promise me not to tell the secret to anyone. 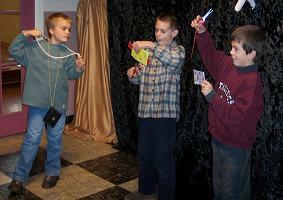 The children of the first year were taught how to make a magic wand float. They got their own wand which they could decorate however they wanted. 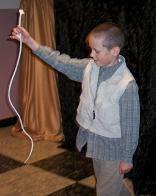 The children of the second year were taught how to magically throw a knot into a rope. The children of the third year got the assignment to turn a long balloon into a dog. The chidlren of the fifth year got a very special assignment. They had to decorate an envellope as a chest and draw themself so they could put their own picture in the ‘chest’. The idea is to cut the chest in two and to leave their drawing in one piece. Whether it would work remained to be seen. 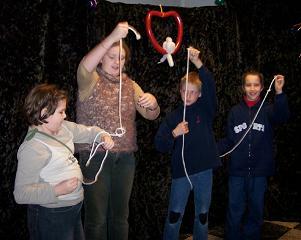 And finally the children of the sixth year were taught to tie a knot in a rope without releasing the ends. 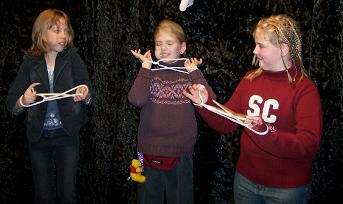 The children of the fourth year were taught the trick with the jumping rubber bands. It was a difficult assignment for the pupils, but also for the teachers at the school. At the book market of the school, the pupils could show their trick. Who succeeded would receive a magic degree. I was very curious. I got a stand where Project Magic was introduced to the parents. 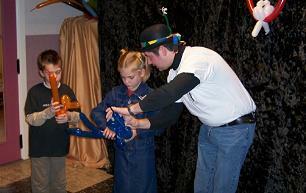 I had also made a little theatre where the children could show their skills. I was really amazed. The wands were very nicely decorated and the children of the fifth year had turned the envelopes into true pieces of art. But could they do the tricks? Well, I can tell you that every one of the children who performed before me and the parents received their diplomas. It was lots of fun. Look at the photos to see how much fun the children had. The parents were very proud too.